SINGAPORE - Three fewer Singapore companies made it this year to Forbes magazine's annual ranking of the 2000 biggest, most powerful and most valuable public companies in the world. 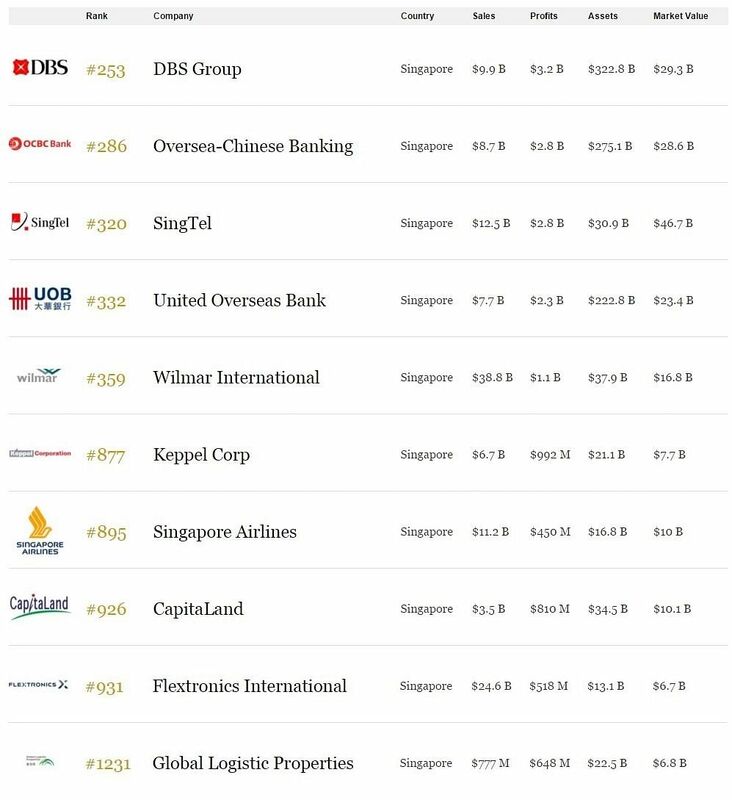 The 17 Singapore-listed firms that did make the list were once again led by DBS Group Holdings which moved up to 253th position from 268th last year. It was followed by Oversea-Chinese Banking Corporation (OCBC), in 286th spot from 302nd, and Singtel (320th from 325th). Coming in fourth and fifth for Singapore firms were United Overseas Bank (UOB) in 332nd place and agribusiness group Wilmar in 359th. Four Singapore companies fell off the list - Avago Technologies, China Aviation Oil, Overseas Union Enterprises and logistics firm CWT. The Forbes Global 2000 ranks companies on a score calculated from sales, profits and assets as well as market value. The 2016 list features public companies from 63 countries that together account for US$35 trillion in revenue, US$2.4 trillion in profit, US$162 trillion of assets, and a combined market value of US$44 trillion. But slowing global growth, collapsing commodity prices and stock market have lopped 8 per cent off the the combined market capital of the Global 2000, said Forbes. Energy companies notably lost ground from a year ago, no surprise considering the fall in oil prices. Exxon Mobil slipped to 9th place, from 7th in 2015, while PetroChina tumbled eight spots to 17th. The United States again boasted the largest number of companies on the list with 587, followed by China and Hong Kong together with 249, Japan with 219, the United Kingdom with 92 and South Korea with 67. Despite a slowing economy, China's banking giants retained their top three spots on the list with Industrial & Commercial Bank of China ranked No 1 for the fourth consecutive year. China Construction Bank and Agricultural Bank of China remained at No 2 and No 3, respectively. Bank of China, though, was knocked back to sixth place from fourth. Legendary investor Warren Buffett's Berkshire Hathaway gained one spot to fourth, after holding up better than most in a turbulent market. Last week Berkshire revealed a new stake in Apple, which clocks in at 8th place on the list, returning to the top 10. For all the hand-wringing over slowing iPhone sales and Tim Cook's management, Apple still generated US$233 billion in sales and US$53 billion in profit over the last year. US and China-based companies dominated the top 10, with only Japan's Toyota Motor at tenth preventing a clean sweep.